Useful Information on Traveling in Tajikistan. Tajikistan is picturesque country in Central Asia, its territory including the highest mountain systems in Central Asia, the Pamirs and Tien Shan, numerous mountain lakes, mountain villages detached from the civilisation, a dam which is the highest in the world, carpets of millions of irises, poppies and edelweiss flowers, crystal waterfalls and a number of historical and architectural monuments. Today’s Tajikistan is popular among trekking lovers, who are eager to follow the numerous routes in the fabulously beautiful Fan Mountains and the highlands of the Pamirs and Tien Shan, mountaineers, who are attracted by high mountain peaks, among which are Ismail Somoni Peak (former Communism Peak, 7,495 m) and some others, jeep travellers, whose favourite road is the famous Pamir Highway, professional scientists and researchers, who study the ancient monuments and historical events, and ordinary people, who are interested in learning old legends in solitary settlements high in the mountains and who wish to visit places where the foot of man has never stepped. At all times Tajikistan has been attractive as an important section of the Great Silk Route, the economic and cultural artery of the East, while Sughd Province of modern-day Tajikistan was once a part of the famous Sogdiana, which is testified by the Sogdian language still spoken in some areas of the province. How to Dress in Tajikistan. Cost of Food in Tajikistan. Visa, Permits and Safety Recommendations. Location. Situated in the southeast of Central Asia, Tajikistan is the most ‘elevated’ country of the region, mountains comprising 93 % of its area. More than half of Tajikistan’s territory lies at an elevation of more than 3,000 m above sea level. 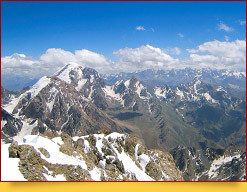 The highest point of Central Asia, Ismail Samani Peak (former Communism Peak, 7,495 m), is also situated in Tajikistan. So, there is no need to say that the nature of the country is not merely beautiful, but fabulously beautiful. Area - 143,100 sq km. Population - 8,000,000 people. The population density is 50 persons per square kilometre, it being spread more or less equally throughout the whole territory of the country. Ethnic composition. Representatives of over 80 ethnic groups populate Tajikistan, of which Tajik comprise 80 %, Uzbeks - 15.3 %, Russians - 1.1 % and Tartars - 0.3 %. Apart from Tajikistan, Tajik also live in Uzbekistan (about 4 %), northeastern Afghanistan (over 3.5 million people), Kyrgyzstan (in regions next to the border with Tajikistan), southeastern Kazakhstan and the Iranian province of Khurasan. Political structure. Tajikistan is ruled by the president, while the legislative functions are performed by a bicameral parliament, Majlisi Oli. Both the president and the members of the parliament are elected for a five-year term. The country features a multiparty system. Administrative and territorial division. The territory of Tajikistan is divided into 3 provinces (viloyat), which include 17 towns, 62 districts, 55 villages and 368 rural communities (jamoat). Thirteen of the districts are administered directly by the state’s government. The capital of the country, Dushanbe, and the 8 districts surrounding it form an individual administrative unit. The population of Dushanbe is 764 thousand people (2013). Official language. Tajik is an official language spoken almost everywhere throughout the country. However, Tajik often use Russian words in their speech, which is caused by the large number of dialects (over 50) differing strongly from one another. Thus, Russian is both an international language and a means of communication within Tajikistan. The Tajik language belongs to the southwestern group of Iranian languages and includes a number of words that came from Russian, Arab and Uzbek. However, their portion is insignificant and Tajik easily communicate with people speaking the literary Persian language. Somoni is the monetary unit of Tajikistan, an only legal means of payment in the country. The Tajik monetary unit was named so in honour of Ismail Samani, the founder of the first Tajik state. Religions. Most of the people of Tajikistan are Muslims, with 85 % professing the Sunni branch of Islam and 5 % its Shiah branch. The other 10 % comprise orthodox Christians, 5 communities of Baptists, 2 Roman Catholic parishes, a community of Seventh-Day Adventists, a community of Jehovah's Witnesses, a community of Lutherans, 2 communities of South Korean church Sung Min, 4 communities of Bahais, one Zoroastrian community and one Judaist community. Standard time zone: UTC/GMT +5 hours. No change to winter time takes place. Electric power. The hotels may have both the contemporary European-type sockets with wide holes and ground connection and the old Soviet-type sockets. 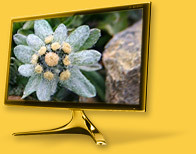 Current with a voltage of 220 V and a frequency of 50 Hz is used throughout. The climate of Tajikistan is highly diverse: subtropical in low valleys, moderately warm at middle altitudes and cold in high mountains. Most of precipitation occurs in winter and spring, while in summer and autumn rains are a rare phenomenon. From October to May severe snowstorms happen in the mountains, with the air temperature dropping to -45°C, which makes climbing almost impossible, while the flat areas feature sandstorms from June to October. These strong winds may last for a week or longer, which must be taken into account when organising a trip into those regions. Strong winds also occur in the winter period, when 2 degrees below zero are felt 10 degrees. Summer actually begins in May and is rather hot, although due to the character of the country’s relief only low valleys feature high temperatures. 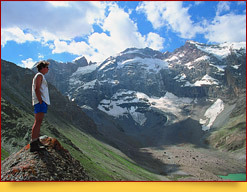 The best time to visit Tajikistan is spring and autumn, although summer is an optimal season for climbing and hiking. 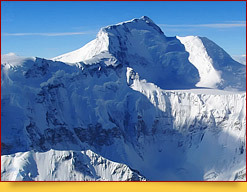 In mountain valleys average temperature does not fall below -5°C in winter and does not rise above +38°C in summer. The type of clothes to be chosen depends on the season and the region you are visiting. In cold seasons the clothes must protect from harsh winds, while in summer light cotton garments would be enough. Headdresses are compulsory for hot seasons. The government makes no demands as to the style of clothes; however, you should keep in mind that Tajik are quite religious, and excessive openness of clothes may arouse dissatisfaction or unhealthy interest. If you are going to have an excursion into a mosque or another religious place, put on loose clothes covering your arms to the elbow and legs below the knees. For mountain hiking and climbing use outfit that conforms with the general rules of these sports. 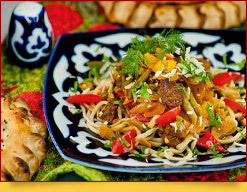 Different Central Asian countries have a number of similar dishes, which is caused by interpenetration of cultures and the common culinary traditions of the peoples. The kitchens of Uzbekistan and Tajikistan have many common features. Manty, pilaf and kovurma lagmon are highly delicious dishes recommended to tourists visiting Tajikistan. Tajik add a little more spice to their food than cooks in the neighbouring Uzbekistan and Turkmenistan, which makes the Tajik kitchen more like that of the Caucasian countries. Onion is also used in large amounts in the local cuisine. Tajik demonstrate special attitude to bakery, which makes the country a real paradise for those who like baked foods. Tajikistan is the place where the unique traditional bread kulcha is made, which Tajik often eat for breakfast, together with appetising pasties with herbs and golden chuchvara. The very name of the bread indicates the size of the loaves, as ‘kulcha’ translates as ‘palm’ or ‘hand’. This size is convenient for mountain shepherds, as they can eat up a whole loaf during a meal, without leaving its pieces. This can be explained by Tajik’s reverential attitude to bread, which is also confirmed by a number of customs: they never lay loaves ‘face down’ and always break bread as carefully as possible, trying not to leave crumbs; the vows ‘on bread’ are regarded as the most serious ones, while to throw bread in somebody’s home means to insult greatly its hosts. Tajik have always eaten fruit in large amounts and considered it a food even more important than meat. So, you can always find a bowl of grapes, apples and peaches adorning a dastarkhan (table) in any house. Meals in Tajikistan are subdivided into ‘cold’, ‘hot’ and ‘middle’ types. The terms have nothing to do with temperature or the way of cooking: they indicate nutritiousness, quantity, good properties of this or that food relative to a season and an individual person. Avicenna was a person to lay the foundations of the original local dietetics. Many of its rules are still effective today, particularly those concerning the serving of dishes and their succession. In comparison to European countries, prices for food in Tajikistan are not merely low, but extremely low. This is caused by the underdeveloped economy of the country and the low level of its people’s living, when prices, if increased even a little, would become unbearable for most of the Tajik. The price for a good dinner ranges between $8 and $10. The citizens of the countries of the former USSR, except for the Baltic countries, Uzbekistan and Turkmenistan, may enter Tajikistan without a visa. People from all other countries need to obtain a visa to visit the Republic of Tajikistan. It will take you about one month to obtain a visa in the Tajik Embassy. Before it, the consular department must get an invitation from the receiving party. Upon arrival to Tajikistan every citizen of a foreign country must fill a migration card and register at a migration service within 3 working days. Those with a tourist visa are allowed to stay in the country for up to 30 days without registration. Those who have other types of visa must register within 3 working days. When leaving the country, the registration card and migration card are to be returned to the passport control officers. Police in the streets are also entitled to check your registration; considerable fines may be imposed on those without registration. A registration card is a special document stamped by the migration service, with the full name of the foreign tourist in question, the number of his/her passport and the term of validity for the registration card recorded in it. You can obtain the registration card from the migration service on your own or, if you are staying at a hotel, the hotel employees can do it. However, not every hotel is able to provide registration, so you should find that out beforehand. The fee for the registration is not included in the price for staying at a hotel: it is considered a special service and is paid for separately. To visit attractions situated close to the country’s borders you must obtain a special permission. The Tajik people are hospitable and friendly towards visitors. However, you should not provoke their dissatisfaction by wearing inappropriate clothes or behaving in an improper way in religious places. Nor should you walk in empty places in the night time, and particularly hike alone in the mountains. 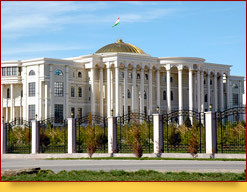 Bringing pornographic materials, drugs, weapons, ammunition and printed matter that may be regarded as threat to the country’s political system to Tajikistan is prohibited. Medicines containing any narcotics may not be brought to Tajikistan, unless the person having them has a prescription for these medicines. Foreigners are not allowed to bring the Tajik national currency, somoni, to the country, as well as to take it out of it. Among other items that may not be taken out of the country are any food, precious stones, gold and minerals. If you wish to buy a piece of jewellery as a souvenir, you should obtain a permission for taking it out of Tajikistan. If you want to take home a handmade article produced more than 50 years ago, you will have to get a certificate confirming that the article is not significant from the historical or cultural aspect. 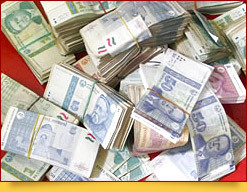 The amount of foreign currency that is allowed to be brought to Tajikistan is unlimited. If the sum in any currency you take with you to Tajikistan is larger than $5,000, it must be declared. However, we strongly recommend that, when entering Tajikistan, you declare all the money you have, as the amount of cash money a foreigner is taking out of the country may not be larger than the sum he/she brought into it. When leaving Tajikistan you must declare an amount exceeding $500. However, there are some particulars that should be taken into consideration: the amount of money you may take out of the country without any accompanying documents must not exceed $2,000. When carrying a sum of over $2,000 through customs, you must provide a document confirming the legality of the money. The customs declaration confirming that you brought foreign currency or currency values to Tajikistan may be such document. The only currency that may be used to pay for goods and services in the territory of Tajikistan is the local monetary unit somoni. Foreign currency (US dollars, euros, roubles, tenge, Uzbek sum and Kyrgyz som), may be exchanged at banks in large cities and at numerous currency exchange offices, which you can find in almost any settlement throughout the country. We recommend that you buy the local currency, somoni, in parts, as you spend it. You should not exchange money in the streets or at market places. Bank cards Visa and MasterCard may be accepted at some hotels and large shops only in Dushanbe and Khujand. Cash dispensers (automated teller machines) can also be found in these two cities. The quality of internet connection in Tajikistan depends on the size of a settlement: the larger is the town the better is the connection. Small villages may have no internet at all. Some hotels and restaurants in Dushanbe and other large cities feature Wi-Fi. Cybercafés can also be found only in large settlements. Photographing and filming at military installations and airports is prohibited. When on an excursion to frontier areas, you should first learn from a guide or other responsible persons what you may photograph and what you may not. Besides, you should avoid photographing local people in the streets, particularly women and particularly those in national clothes, without asking their permission. Photographing and filming some historical monuments and other important objects may cost additional money. When you come to choosing souvenirs and presents, you should first pay attention to gold-embroidered articles, as the items of this type made by local mistresses rival those made in Bukhara! 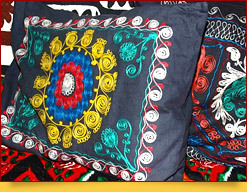 Possibly, some elements of the national clothes of Tajikistan can hardly be worn in other countries; however, handmade scarves and kerchiefs of various types, certainly, do not belong to this category. Local handmade leather articles, such as charms, purses, wristlets, straps, shoes and a lot of other things, will appeal to those who are fond of souvenirs. Unique ceramic items made using the ancient pottery technologies of Tajikistan, for instance, delicate salt cellars or incredibly beautiful dishes, can adorn a dinner table at any home. If you buy a souvenir at a bazaar, you should enlist the help of a person who can tell an authentic article produced by local masters from a serial one made in China. An item bought at a souvenir shop can hardly be a fake; however, there you cannot bargain and therefore will be deprived of an opportunity to participate in one of the most enjoyable oriental customs - the bargaining. Tajikistan country code is +992 (8-10 992). If you want to phone somebody in Tajikistan from outside the country, you will have to dial the international exit code of the country you are in, add 992, Tajikistan area code / mobile network operator code and subscriber’s number.